Image by Charles Steadman, viewed 7347 times. There is very little information on the manuals that were produced before the format was standardised in 1909. 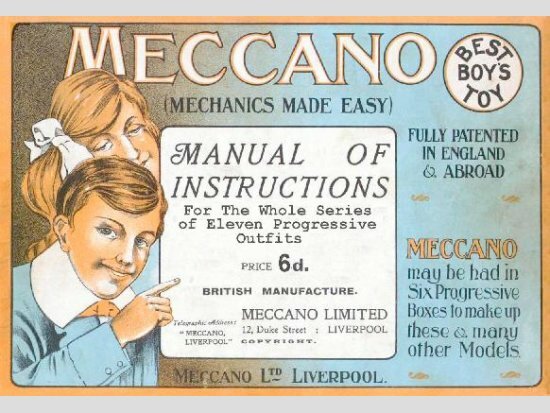 The only information I have is from Tony Knowles "Listing of Meccano Manual Models" that has a list of the model content of manuals from 1904 through 1977, a selections of covers and details of the primary colour schemes. drawings with a few photos. The size was approximately 5.5" x 8.3". In 1907 a more pretentious manual was produced, still titled "Mechanics Made Easy" but with a photo on the cover of a boy playing with a crane and a girl looking on. The colour was brown. The models were arranged better with many more models and descriptions for building. Still with the same size. This is only a make believe manual. I don't even know if one existed in this form. I contains all the correct models from all sets of the era. I was only meant to show what the models were in the range of sets of the year.